Welcome to the first story DLC from “The City That Never Sleeps”. This is the first of three planned for Spider-Man, which are all the continuation of the same story. This has you helping out Black Cat and pits you up against Hammerhead’s posse. To start up the DLC, you will need to load up a save and go to your main menu and to the DLC tab then select The Heist content. This DLC does not add any new mechanics to the game or gadgets. 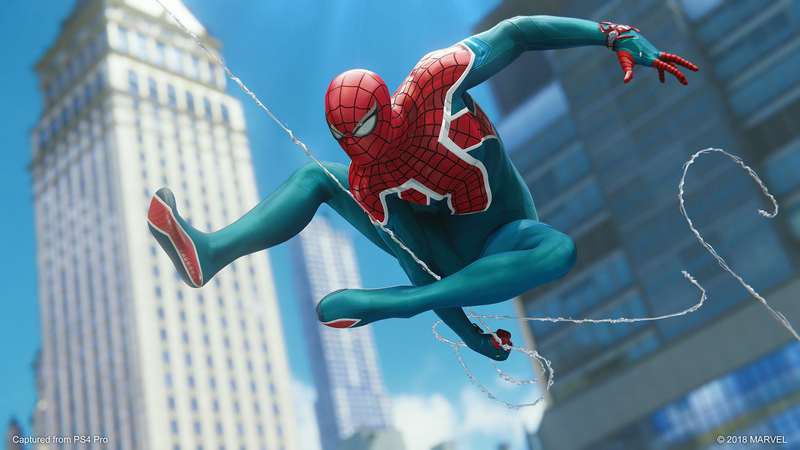 It does add three new suits, which have no powers associated with them, which will all be unlocked by getting the DLC to 100%. This DLC is separate from the main story. The only things you can complete in here from the main story are any backpacks you may still have yet to get or taking pictures of any of the landmarks, which they are not needed for the 100% trophy. This is also a good opportunity to obtain more challenge tokens if you need anymore to unlock any of the suits or if you want to upgrade more of your gadgets. Nothing is missable. Just go about this however you want. All you have is the story missions, a few challenges, some crime activities and finding some stolen art around the city. Once you finish the DLC, you are able to free roam again. Finish any of the side district stuff you might have left for the 100%. Like in the main game, you will need to 100% each of the districts that have objectives to them. This time you’ll only have to complete 5 of the districts instead of 9. These objectives will range from completing crimes, finding stolen art and doing Screwball challenges. Of course, you will also have to finish the story as well to reach the 100%. You’ll unlock the challenges after you complete the main mission “Something is Screwy”. There is a total of 5 different challenges to complete. 2 combat challenges, 2 EMP challenges and 1 gadget challenge. You only need to obtain the second rank out of three for this in each of the 5 challenges. EMP Challenge – This will have you go around destroying EMP towers in the right order. You will need to use the OMG spots to gain extra points as well. This judges you on order, photobomb bonus and time. To use the photobomb, you will need to press and to go through the area and then press when the meter is in the green for maximum bonus. Combat Challenge – Basic beat them up. You’ll get judged on combos, final health, time and photobomb along with the base enemy score. To utilize photobombs, you will need to defeat enemies in a certain area and then press when the meter is in the green for maximum bonus. Gadget Challenge – You’ll gain points by just using gadgets to take down enemies. You will get points for multi-takedown bonus, photobomb and time. I found that just spamming the gadgets got more than enough points with the multi-takedown bonus, where you didn’t need to do any photobombs. If you want to, you’ll need to stick them to the signs around the area with the gadget and then like the other ones, press when the meter hits the green area. These will unlock after you complete the main mission “The Trouble with Arson”. Not all districts will have crimes appear in them. Go to the main menu and check out each district to see if they are available in that area. The ones that have crimes available, there will be at least 5 to complete in those districts. They are the same type of crimes you’ve dealt with before but now they have an additional bomb defusing one, where you will use the spider-bot. This will unlock upon the completion of the main mission “The Maria”. This will unlock upon the completion of the main mission “Pursuing the Truth”. This will unlock upon the completion of the final story mission “Follow the Money”. This is a side mission which is unlocked by finding all the Hardy’s Stolen Art pieces around the city. The locations of the art is located on your map. Once the side mission is unlocked, go to the marker and watch a small cutscene to complete the side mission.